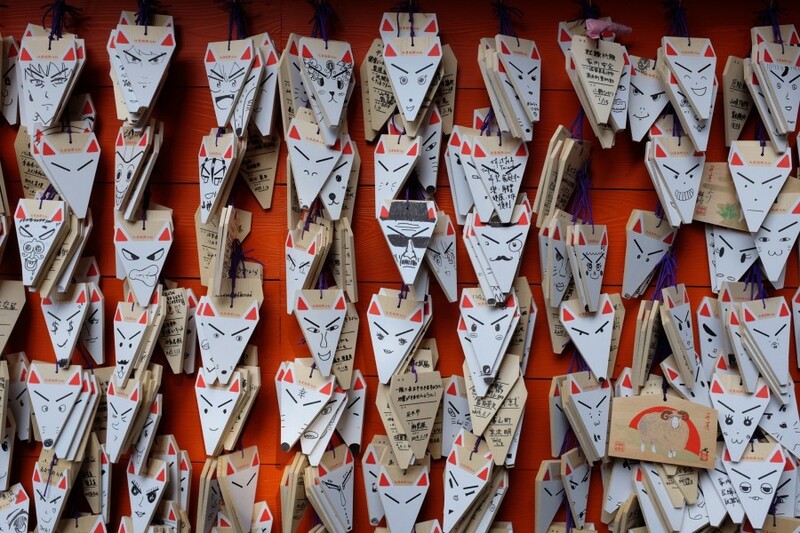 This is a wall of fox wish plates at The Fushimi Inari Shrine in Kyoto, Japan. My husband traveled to Japan to observe a medical procedure for patients with pulmonary hypertension. On his day off, he poked around Kyoto. I love this photo. Apparently, they had a lucky charm store and a couple of shrines. They sold wooden plates that look like a foxes. You can buy a fox plate, draw your wish and a face for the fox on it, and put it on the rail by the shrine. Pretty cool! When I saw this image, I want to do a DIY project in the hallway of our house. This completely negates the shrine aspect of the fox god. But, still, it would be cool if you could decorate fox plates upon entry to our home and then hang them on the wall. I can only image that many of the fixe faces would look like a TV remotes, as my girls want to watch videos all the time. I would wish for a real fox. And then I could ask it, “What time is it Mister Fox?” My husband would wish for unlimited amounts of time to play loud music in the house (so maybe he would draw a fox with a jaunty jazz hat and drum sticks?). What would you wish for? Obviously, we wish for good health. Actually, we wish for that every night before we go to bed. Fox or no fox god, please protect us.